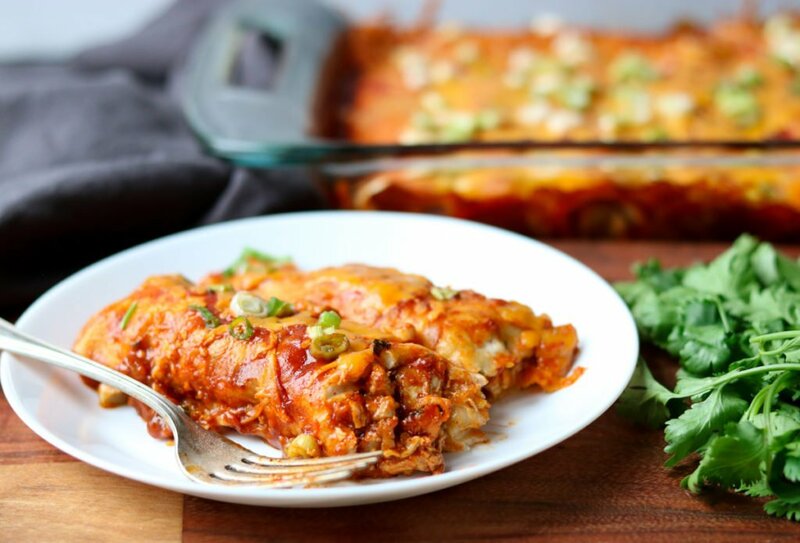 You cannot go wrong with Chicken Enchiladas for dinner! It is a favorite at our house. If I had to only eat one thing for the rest of my life Chicken Enchiladas would be a hard contender! So now that you know my love for Chicken Enchiladas you know I take the recipe very seriously! I have perfected it thru the years and found a sauce that I stand by 100%. My Chicken Enchiladas are full of tender chicken, garlic, red onions, cilantro and cheese. The outside is warm and flavorful with lots of red enchilada sauce, ooey gooey cheese, and fresh green onions. I go back and forth on what kind of tortillas I use, sometimes it’s flour and sometimes it’s corn. It depends on 1. what I have in my kitchen, and 2. what sounds good. There are a few ways that I recommend cooking your chicken for enchiladas. Buying a rotisserie chicken is the easiest way, and probably my preferred method. Shred both breasts, discarding the skin. You end up with super juicy and tender chicken. Poaching the chicken breasts is my second preferred method. This is great if you do not have time to grab a rotisserie chicken. Place 2 chicken breasts in a pot with enough water to cover the chicken by 1 inch. Add salt and simmer on the stove over medium heat for 15-18 minutes until the chicken is cooked thru and reaches 165° in the thickest part. Let the chicken cool for 5-10 minutes before shredding. You can use 2 forks or clean hands to shred. Sometimes I will finely chop the chicken instead of shredding. If you have an instant pot, this is a really quick way to cook your chicken for shredding or chopping. 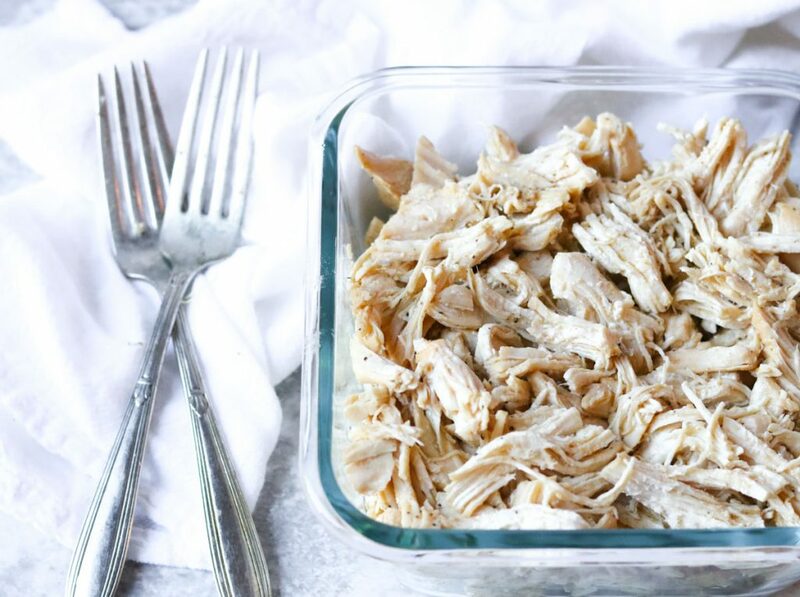 You can find the recipe and instructions for Instant Pot All Purpose Shredded Chicken here. I’m all for a good shortcut in the kitchen. Ingredients that other people have already perfected are a great way to save time- like marinara or enchilada sauce. 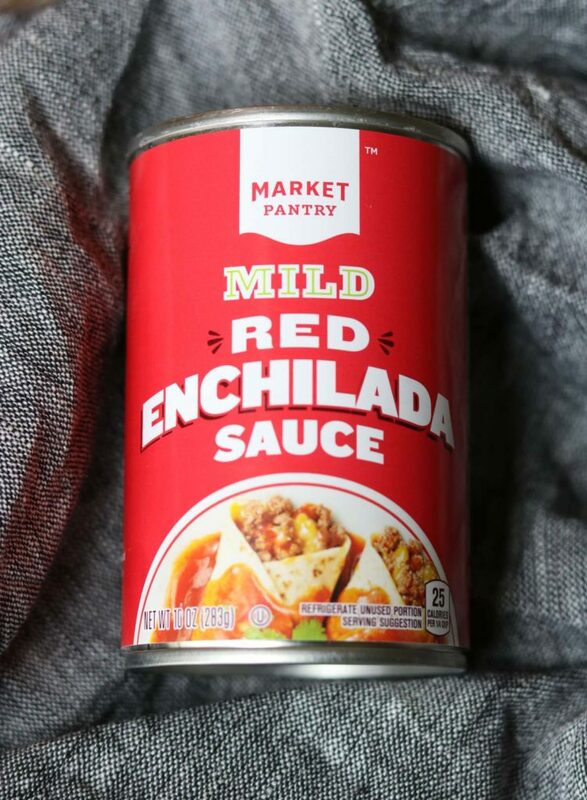 I have tried A LOT of different enchilada sauces thru the years and found that my very favorite sauce is Market Pantry Red Enchilada Sauce from Target. It has an intense enchilada flavor and the vinegary tang that I want my sauce to have. This really depends on your personal preference. It is more traditional to use corn tortillas. But, I find that sometimes they can be hard to work with. They are very temperamental and crack and tear easily. Flour tortillas (fajita size) are much easier to work with, but you will be missing the extra flavor of corn. However, I do love the texture of the flour tortillas after they have soaked and baked in the enchilada sauce. They become soft and almost buttery. So it’s really a toss up. I say if you have the patience- use corn. If all you have is flour tortillas- use flour. Keep it simple and don’t stress about these little things! This recipe will turn out whether you use flour or corn… because this Chicken Enchilada recipe is THAT delicious. In a large saute pan cook the garlic and red onions in oil over medium heat until the onions become slightly translucent, about 5 minutes. Then you will add your cooked, shredded or chopped chicken, cilantro, 1/3 cup enchilada sauce and all the spices/seasonings. Stir the mixture until the chicken is coated with all the seasonings and sauce. Pour the remaining 2/3 can of enchilada sauce in the bottom of a 9×13 glass baking dish. 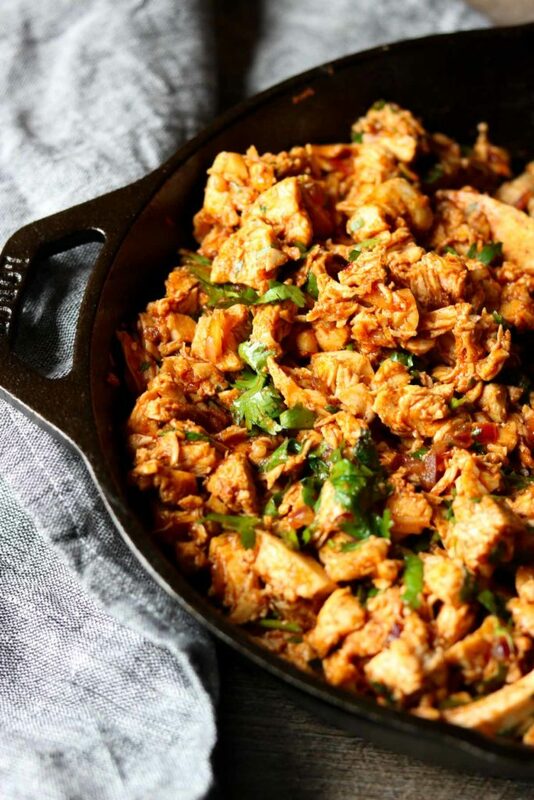 Lay a couple spoonfuls of the chicken mixture down the center of the tortilla. Sprinkle the chicken with a pinch or two of cheese. Now roll the tortilla over the chicken mixture, like rolling a cigar. Once the pan is filled pour the remaining can of enchilada sauce evenly over the top of the enchiladas. If you like your enchiladas super saucy, you can use an extra can of enchilada sauce poured over top. Sprinkle the remaining cup of cheese and finish with all the green onions. Cover the pan with foil and bake at 350° for 25 minutes. Then remove the foil and bake for an additional 10 minutes until the cheese is melted and the sauce is bubbly. Let the Chicken Enchiladas cool for about 5 minutes before serving. Add black beans to the chicken mixture for a little more protein. Try using ground beef instead of chicken. Use whatever cheese you have on hand. Monterey Jack, Colby Jack, Mexican Blend, Cheddar, or Pepper Jack would all work just fine. Corn Tortillas or Flour Tortillas, use whatever you have or whatever you prefer. I prefer Market Pantry Red Enchilada Sauce, but use whatever red enchilada sauce you like. If you want some heat add a few pinches of cayenne pepper or red pepper flakes to the chicken mixture. 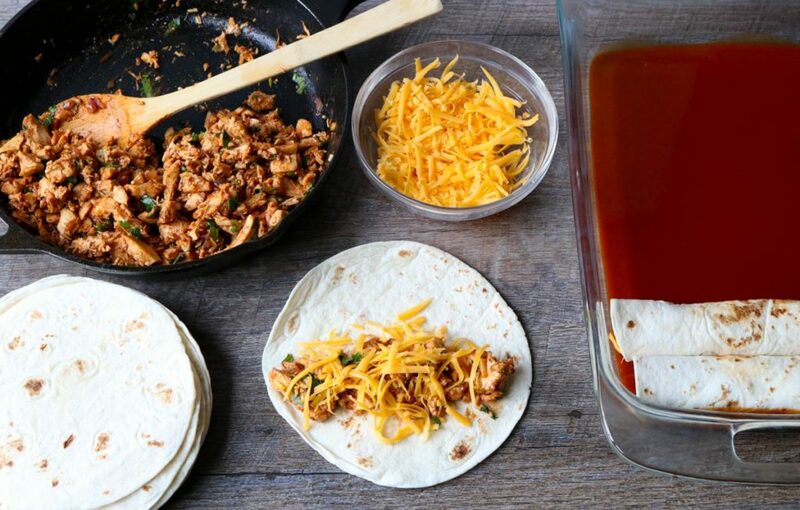 Try using Green Enchilada Sauce for a Verde Chicken Enchilada. This is one of my favorite dinners. Like usual I keep the sides pretty simple! I like to serve my enchiladas with my Easy 15-Minute Refried Beans, sometimes I will also make some cilantro lime rice, you can find that as a bonus recipe here. 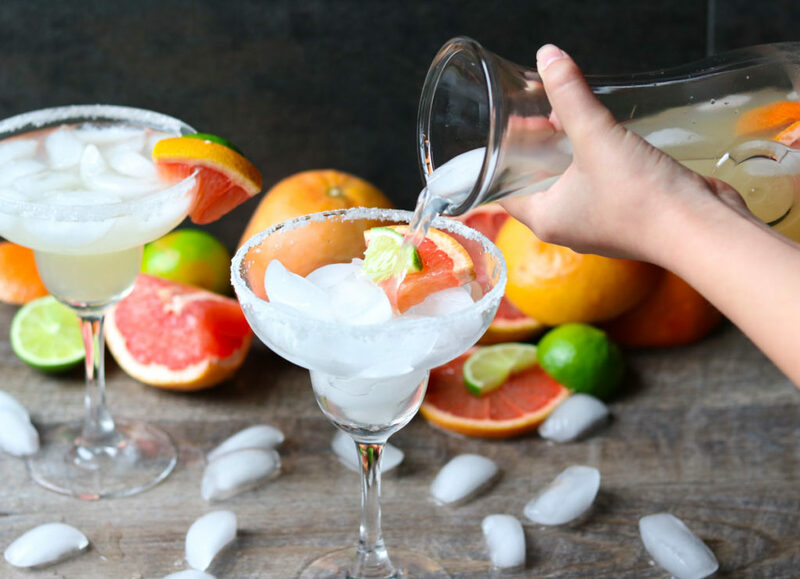 Don’t forget the Best Ever Grapefruit Margarita , or Rosemary Paloma & Restaurant Style Salsa with chips! 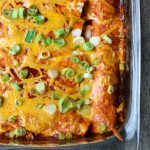 If you love enchiladas as much as I do, you can also check out this recipe for Verde Chicken Enchiladas. Did you make one of my recipes and LOVED it!? Let this mama know! Comment below on this post, drop me a line, or message me on facebook or Instagram. If your recipe turned out super beautiful, share a pic on social media! But, don’t forget to tag me @momsdinnerinsta on Instagram or @momsdinner on Facebook. If you want to share my recipe and pics to social media, the buttons at the top of the post make it super easy! 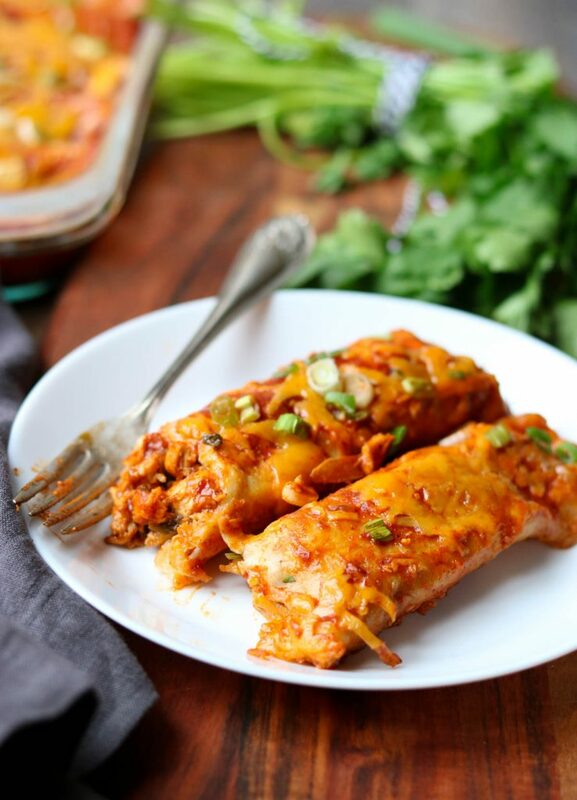 I hope you give this recipe for My Favorite Chicken Enchiladas a try in your kitchen! Don’t forget to save the recipe for later. Pin it here. This Chicken Enchilada recipe is fool proof and 100% delicious. Full of tender chicken, garlic, onions, cilantro, tangy enchilada sauce and lots of ooey gooey cheese! In a large non-stick skillet saute the onions and garlic in the oil over medium heat. About 5 minutes until the onions are slightly translucent. Add the cooked chicken, cumin, garlic powder, onion powder, chili powder, salt, red pepper flakes, cilantro and 1/3 cup enchilada sauce. Stir to coat the chicken with all the seasonings and sauce. 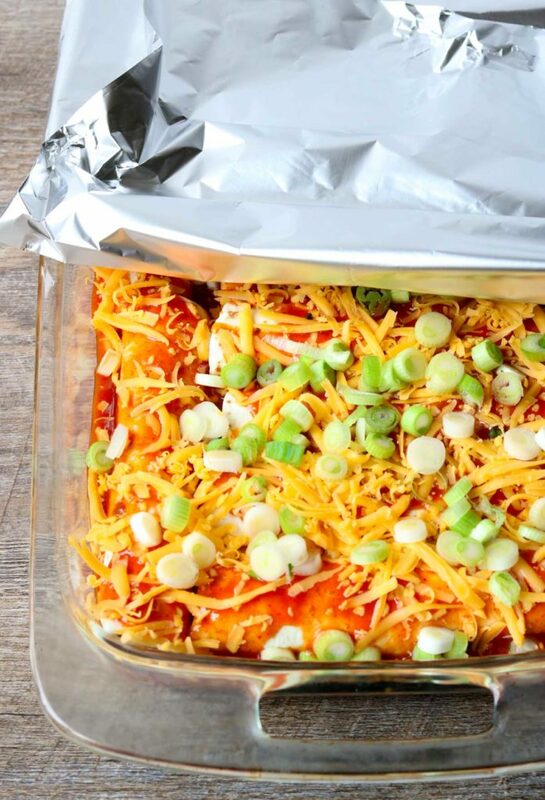 Prepare a 9x13 glass baking dish by pouring the remaining 2/3 of the opened can of enchilada sauce to the bottom of the pan. Now set up an assembly line for your enchiladas. Tortillas, chicken filling, 1 cup of shredded cheese, and the prepared pan. Place a few spoonfuls of chicken down the center of one tortilla and top with a few pinches of cheese. Roll the tortilla over the filling and lay it, seam side down, in the prepared pan. Continue this process until all the tortillas and filling are used. You will have 10-12 enchiladas. 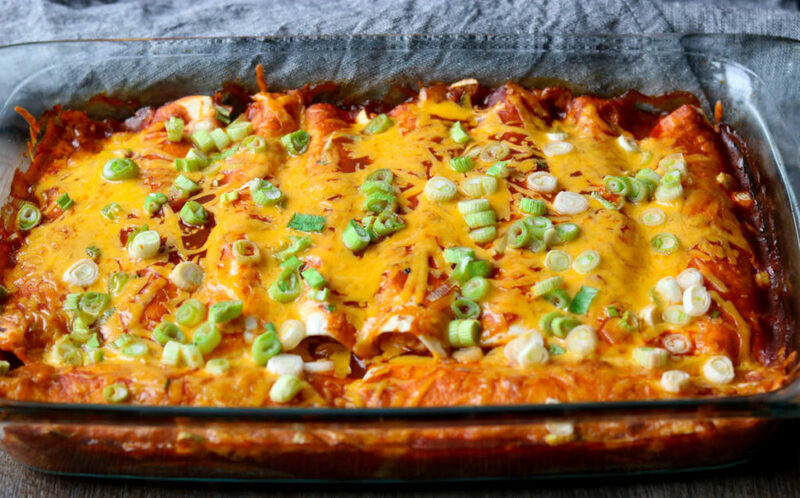 Top the rolled enchiladas with the remaining can of sauce, remaining cup of cheese and all the green onions. Cover the pan with foil and place in the preheated oven for 25 minutes. Remove foil and bake for an additional 10 minutes until the cheese is melted and the sauce is bubbling. Enchiladas are one of my all-time favorites! These look DIVINE! These seem absolutely divine. Next time I go shopping enchilada sauce is definitely on the list. (I already have everything else). Hi Caroline!!!!!! I hope you are well : ) Thank you for reading my post. 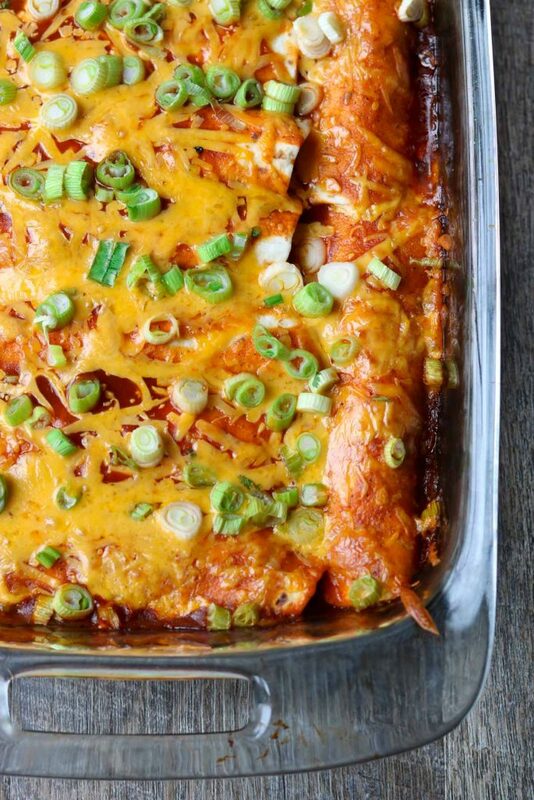 Definitely make these enchiladas. You will love them! You’re making me want to go get Mexican food for dinner tonight! Honestly, I’ve never made enchiladas from scratch, though I do have an enchilada-inspired casserole recipe that I love. Definitely going to have to give this a try next time. 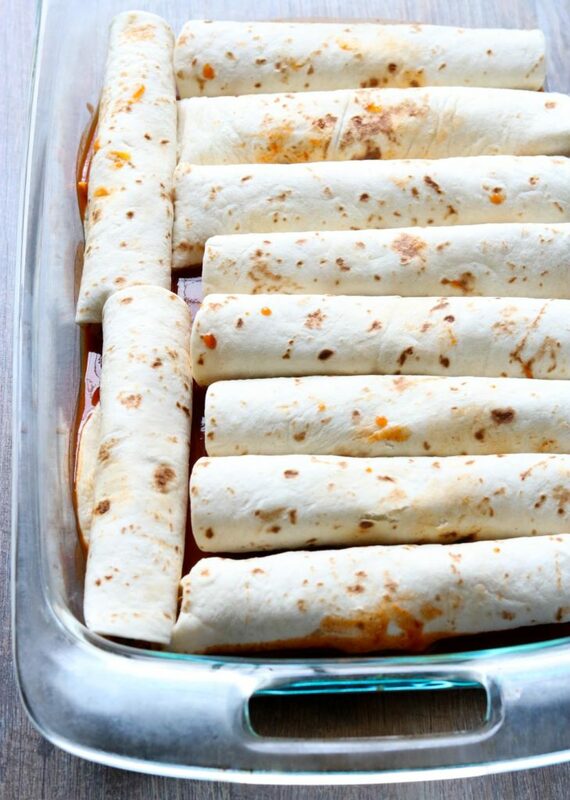 Truly my recipe is so easy… I think traditional enchiladas can be pretty time consuming and messy, with pan frying corn tortillas and dipping them in sauce before rolling them. I keep my recipe super simple. Definitely give it a try! i love all mexican food but I have a soft spot for enchildas!! especially chicken! theses look great! Thank you! Me too… I think I could eat them every day and be perfectly happy. We were having chicken burrito bowls for dinner tonight, but I might switch it up and make these instead. They look great! I love enchiladas, especially chicken enchies!! I’m a flour tortilla gal all the way! Your enchiladas look so scrumptious and I can’t wait to try your recipe, especially with the sauce! Oh these are perfect looking! Haven’t seen that enchilada sauce. Need to make a trip to Target now! I do love some good enchiladas and your recipe looks great. It really is only breakfast time where I am right now, but it’s ok to be drooling over some dinner food, right? I do the same thing!!! I’ll be like “oooh that hamburger looks good, oh wait it’s only 9am”. I guess that is the life of a food blogger, right!? what? dinner for breakfast is just like breakfast for dinner. go for it! these look fabulous at 6am, haha.